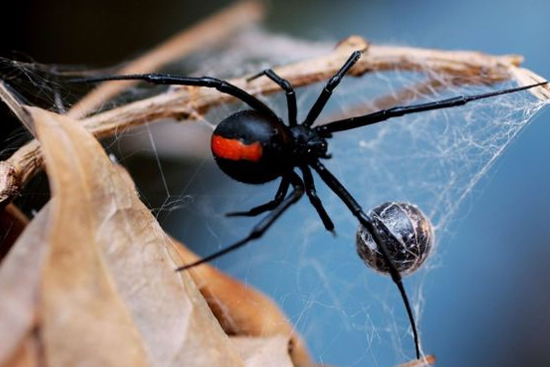 The redback spider (Latrodectus hasseltii) is a species of highly venomous spider indigenous to Australia. It is a member of the cosmopolitan genus Latrodectus, the widow spiders. The adult female is easily recognised by her spherical black body with a prominent red stripe on the upper side of her abdomen and an hourglass-shaped red/orange streak on the underside. Females have a body length of about 10 millimeters (0.4 in), while the male is much smaller, being only 3–4 mm (0.12–0.16 in) long. Mainly nocturnal, the female redback lives in an untidy web in a warm sheltered location, commonly near or inside human residences. It preys on insects, spiders and small vertebrates that become ensnared in its web. It kills its prey by injecting a complex venom through its two fangs when it bites, before wrapping them in silk and sucking out the liquefied insides. Male spiders and spiderlings often live on the periphery of the female spiders' web and steal leftovers. 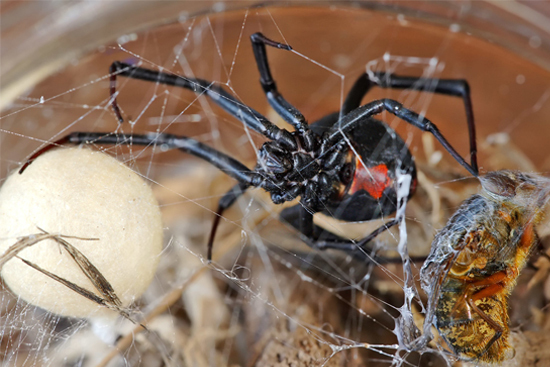 The redback spider is commonly found in close proximity to human residences. Webs are usually built in dry, dark, sheltered sites, such as among rocks, in logs, tree hollows, shrubs, old Tyres, sheds, outhouses, empty tins and boxes, children's toys or under rubbish or litter. Letterboxes and the undersurface of toilet seats are common sites. Populations can be controlled by clearing these habitats, squashing the spiders and their egg sacs, and using pesticide in outhouses. Recommends against the use of spider pesticides due to their toxicity, and because redbacks are rapid recolonizes anyway.